Make it easy for people to come. Show pictures of what’s possible. Have people vote with post-its. Give people something to do. Have fun projects for kids and grownups. Invest people in the outcome. Use social media to your advantage. Irrigate, an artist-led creative placemaking initiative that spans the Central Corridor Light Rail line in Saint Paul, gives a more formal definition of “placemaking” as, “The act of people coming together to change overlooked and undervalued public and shared spaces into welcoming places where community gathers, supports one another, and thrives.“ Placemaking can involve temporary activities such as performances and chalked poetry, or more permanent installations such as landscaping and unique art. Creative placemaking was the focus of the final Twin Cities Media Alliance Get Connected! community meeting, held in partnership with Envision Minnesota at St. Paul’s Chatterbox Pub on October 30. Mazullo’s list comes from a blog she wrote about the event, synthesizing the lessons of the Charles Avenue Friendly Streets group. The Get Connected! event featured opening remarks by Mazullo and Envision’s executive director Lee Helgen. Most of the evening was devoted to presentations by Hamline Midway Coalition members Lars Christensen and Erin Pavlica, and Twin Cities Media Alliance neighborhood engagement coordinator, Marcos Lopez-Carlson. Lopez-Carlson, in his presentation, illustrated how blogging, Reddit, and other new media tools can play a major role in placemaking. He told about a recent public art project that turned Chicago sidewalks into a colossal Monopoly board game. Formerly known as 10,000 Friends, the nonprofit now known as Envision Minnesota was founded in 1993 to address citizens’ concerns with Minnesota’s sprawling growth patterns. Envision’s mission is to promote thoughtful development, healthy communities, and sustainable land use that conserves natural areas, family farms, woodlands and water. One of many ways that it engages community members is through promoting creative placemaking projects. 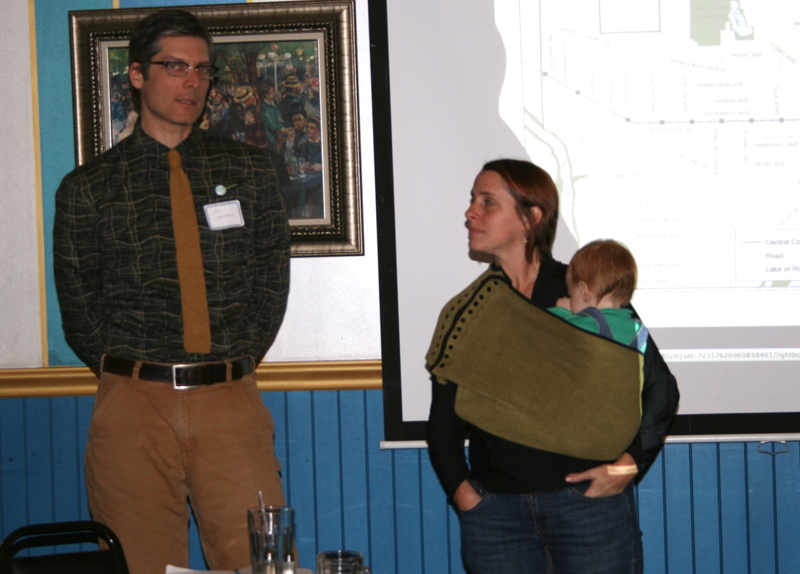 In St. Paul, creative placemaking occurred when the Hamline Midway Coalition and Frogtown Neighborhood Association joined forces in 2010 to bring residents together to reimagine Charles Avenue, the site of a proposed bikeway. As Grace Grinager reported in an earlier article, this has been the source of some controversy. For example, some residents protest that by providing protection for one street, Charles, some of the surrounding streets will become more dangerous. Pavlica, a community organizer, and Christensen, an Augsburg sociology and urban studies professor, are both Hamline Midway residents. They shared details of what has transpired on Charles and what they have learned from the experience. City planning meetings and public hearings are where conversations about development decisions typically occur, noted Pavlica and Christensen, and these settings are not inclusive. Placemaking activities, by contrast, offer opportunities for democratic action to happen because they engage people where they live, literally “taking it to the streets,” instead of forcing residents to go elsewhere if they want to have a voice. Friendly Streets Block Parties along Charles Avenue in the Hamline Midway and Frogtown neighborhoods, were at the core of the initiative. Christensen observed that few residents who attended the five outdoor street events would have attended a public hearing or planning meeting. Besides being based where people live, the block parties were a draw because they were fun, interactive, family-friendly, and offered a chance for neighbors to mingle and deliberate with each other. Plus there was food from local restaurants, including Flamingo and Izzy’s Ice Cream. Outdoor galleries offered residents an array of illustrations about what could occur on Charles. These stirred conversations and led to citizen input through votes people cast with post-it notes and written surveys they filled out. All of this data was then passed on to decision-makers. City officials and staff at Transportation for Livable Communities, the nonprofit organization administering federal grants for the bicycle boulevard project, have applauded the initiative for spurring such a high level of civic engagement. More than 700 people attended five Friendly Streets Block Parties in the summer of 2011. Attendees cast more than 1700 votes on a series of 24 potential design elements, ranging from speed bumps and traffic circles, to bike boulevard striping and signage, to various forms of public art. There were also 203 surveys gathered at the block parties. Christensen reports that the group held three additional events in 2012, which increased the total estimated outreach to 877 people, and the total number of opinions expressed to over 2400. Want to know more about bicycle boulevards, Friendly Streets, and the Charles Avenue project? The Frogtown Neighborhood Association offers a handy FAQ. The pavement of Lyndale Avenue was packed with bikes, skateboards, rollerblades, strollers, wheelchairs, and feet of all ages this Sunday during the first Open Streets Minneapolis event of the year. The Lyndale event also included activities along the avenue for people of all ages, including art projects, games, music stages featuring local artists, BMX and skateboard competitions, a bouncy house, and a pop-up theater. On January 1, we had a big change: SPOKES (the community bike center just east of the LRT on 22nd Street) merged with Cycles for Change, a community bike center headquartered in St. Paul. 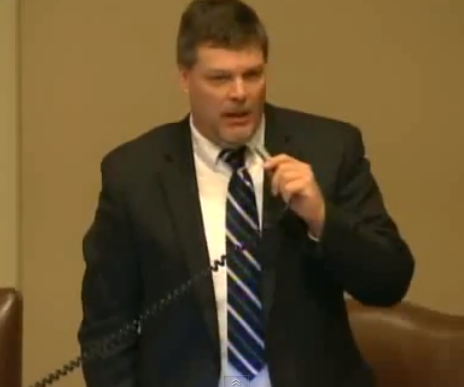 Rep. Jim Newberger (R-Becker) is against more funding for Minnesota’s North Star rail, a line that was originally supposed to go between Minneapolis and St. Cloud but has yet to be extended that far. I called Ron Whyte, one of the owners of Big Daddy’s Old Fashioned BBQ on University Avenue in St. Paul. I was trying to ask him how the trains of the Green Line had affected his business since the line opened a little more than a year ago. It was mid-afternoon, and he was behind the counter. "Call after 6:00 pm, when we're closed," he told me. “I can’t talk. We keep getting customers.” Big Daddy’s BBQ is doing well. The success is less about the Green Line and more about entrepreneurship, but the spark for the new success came from the new light rail just outside their door.